The Supervisory Board of Gigaset AG has appointed Kai Dorn (35) as the new Chief Financial Officer (CFO) of Gigaset AG effective January 1, 2015. The Supervisory Board has also decided to extend the contract of CEO Charles Fränkl by two years. The engagement of Maik Brockmann, responsible for Corporate Affairs, will end when his contract expires on March 31, 2015. 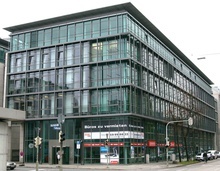 The headquarters of the Munich-based telecommunications company Gigaset is moving to another location in the city. The new head office of the European market leader in DECT cordless phones will be the Seidl Forum at the heart of Munich. As a result, the company is moving from its former site at Siemensstadt in Obersendling, where the company had its roots, to the center of Munich. EBITDA from continuing operations in the third quarter: €4.4 million (Q3/2013: €3.8 million). Consolidated net income from continuing operations in the third quarter: minus €0.2 million (Q3/2013: minus €3.8 million). Consolidated revenue from continuing operations in the third quarter: €72.0 million (Q3/2013: €76.6 million). Free cash flow from continuing operations in the third quarter: €7.6 million (Q3/2013: minus €9.9 million). Around 150 shareholders, shareholder representatives and guests attended the AGM of Gigaset AG at the Hanns Seidel Foundation in Munich. The investors present were asked to vote on six agenda items, which were approved by a large majority. Thanks to successful implementation of the efficiency programs and the elimination of negative one-off tax effects from the previous year, Gigaset AG was able to again post positive consolidated net income of €1.3 million from continuing operations in the second quarter of 2014. The company made a net loss of €9.4 million in the same period of the previous year. Dr. Alexander Blum, the Chief Financial Officer of Gigaset AG, today informed the Supervisory Board that he will terminate his contract of employment by the due date effective December 31, 2014. Dr. Blum will fully discharge his duties until the end of the year so that a successor can be appointed and become familiarized with the tasks. That will ensure a smooth handover. Gigaset AG today repaid all its financial liabilities, including all unpaid interest, totaling €25.0 million. This was made possible by the proceeds from the capital measures that were successfully placed recently and brought Gigaset in a net sum of €33.9 million. "The Gigaset Group is now completely free of financial debt and so has a raft of new options to ensure that its growth strategy can be financed further," says CFO Dr. Alexander Blum. As part of the rights offers made by Gigaset AG (ISIN DE0005156004) and completed as scheduled on July 14, 2014, 3,5% of the subscription rights to shares and 1,5% of the subscription rights to convertible bonds were exercised. Despite the continuing decline in the market in its core business of cordless phones, Gigaset was able to increase its market share in Europe year on year by a total of 1 percentage point in terms of units sold in the first quarter of 2014. The overall market for cordless phones in Europe declined in the months January to March 2014 by almost 13 percent in terms of revenue in the markets observed by Gigaset. The picture was the same in almost all the observed markets. 2013 annual results: Gigaset rigorously continues its reconstruction. Crucial steps to stabilize the company reap success.